Leopard print nails were the first nail art design I ever tried. These days though I don't have the time to wait for layers of nail polish to dry. Nail wraps are perfect for when you don't have time to spend to faff with polish and dotting tools. 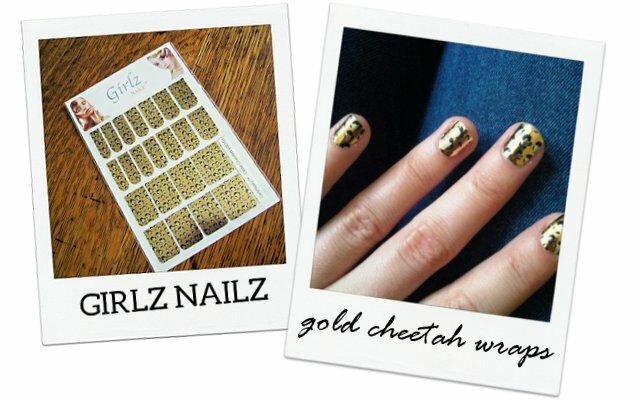 I had the opportunity to try out Girlz Nailz gold cheetah wraps*. In the pack are stickers for both fingers and toes. All you need to do is select the correct size for your nails, line up the nail wrap with your cuticle and press on. Then trim with scissors and file to shape. Once applied, the Girlz Nailz wrapped looked really impressive. The only issue I had was a few bumps along the side of my nail, but on first glance, these weren't noticeable at all. Available in a range of patterns and finishes, I'd definitely use these again for a festival or holiday.